Tall fescue is one of the more important cool season grasses. It is known for its dark green color, wear resistance and heat tolerance. Of all the types of grass, this is one of the few cool season grasses that can do well in areas outside of what is considered its normal adaptation zone. It even does well in the dry heat of southern California, where it is a popular turfgrass. Tall fescue is divided into two groups. They are the "coarse fescues" and "fine fescues". Coarse fescue is the type most commonly seen growing in the full sun sections of lawns. The second group of fescues is known as "fine fescues". (Fine fescues are not the same as "turf-type tall fescues".) The term "fine fescue" is used for a number of fescue species that are named for their very fine (narrow) blades. In the U.S. most of the fine fescues are exclusively used for shaded areas, since they can't take high heat. I still hear of people that have planted fine fescue, creeping red for example, in their full sun yard. It looked good until summer hit and then completely died. Learning the difference will save you a lot of headaches. Coarse fescues have some of the widest grass blades, while fine fescues have some of the narrowest blades of all grass species. Coarse fescues can grow as wide as 5/8", while fine fescues can be less than 1/16". The first group is simply referred to as "coarse fescue" or "field-type tall fescue". These are primarily bred as pasture grass, but can be used in lawns. The other is called "turf-type tall fescue" and is an improved variety deveoped to have the qualities needed to be a true lawn grass. Kentucky 31 tall fescue and Alta are examples of the older varieties. They were originally a forage grass, but were sometimes used as a turf grass. 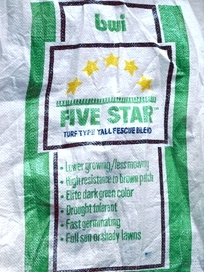 If you ever purchased Kentucky 31 tall fescue, you may have noticed that the bag is labeled "For fields and lawn use". These field types are a larger plant with blade widths 1/2 inch wide or more and reaching twenty-four inches high. If left uncut in the field, the stems and seed heads can reach four feet. They do not produce a thick turf and are not compatible with warm season grasses, such as bermudagrass. Whenever these field type tall fescues are growing in dormant bermudagrass, the fescue has the tendency to grow in large clumps. During the winter, these clumps stand out like a sore thumb. 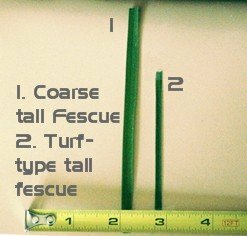 Turf-type tall fescue has a much thinner blade width. They were developed specifically for lawns and are the type used by professional turf managers. There are dozens of varieties with many new varieties on the market from the last few years. Most will produce a dark green, beautiful lawn. All fescues are "bunch" grasses. This term means the plants expand by the production of new grass blades, called "tillers". See our page on Plant Structure for even more helpful information on grass growth. A tiller is a new leaf blade that grows from the base of the original plant. Each new tiller develops its own root system separate from the other tillers. One plant could produce dozens of tillers. It does not produce any "runners" like some other grasses. Since tall fescue is a bunch type grass and does not spread, it is necessary to overseed occasionally to maintain turf thickness. The best time of the year to overseed is in the fall. This gives the seed time to germinate, grow and develop sufficient root depth before the summer heat arrives in the following year. There are a growing number of seed cultivars for turf-type fescue. Each is breed for certain qualities and for growth under certain conditions. Since there is no single type of tall fescue that works best in any given area, most bags will come premixed with three or four different varieties. Tall fescue is probably the second most widely used cool season grass with a broad area of adaptation. It is used throughout the cool arid, cool humid and transition zones. Click on the link to see a map of Turfgrass Adaptation Zones. Tall Fescue has high wear tolerance and for this reason, is often used on sports fields and playgrounds. It has the ability to withstand high temperatures and is used in areas where other cool season grasses would fail. It is even used extensively in urban areas of southern California where summer temperatures exceed 110 degrees for days at a time. When properly cared for, tall fescue comes through looking great. The one drawback is its high water usage in summer. It is occasionally used in the northern parts of the southern adaptation zone by homeowners who prefer it to warm season grasses. Again, the water usage in hotter climates will be higher than in the cooler areas of the country. Fescue will struggle in hot, dry summers, especially in the lower half of the U.S. or out west. It requires significant water during summer drought. The drought of 2012 decimated my fescue lawns even when water was added. It was just to hot for too long. Over-seeding was necessary that fall to restore the lawns to their previous beauty. Tall fescue has good cold tolerance except for the coldest areas of the northern U.S. and Canada. In these places, it has been known to suffer from winter damage. Its greatest use is in the central U.S. It is susceptible to the fungal disease "brown patch" in high humidity areas. However, in all the years I lived in Southern California, I rarely saw a problem with brown patch disease because of very low humidity. Now that I live in Missouri, I frequently encounter the problem. Watering at night, or late in the evening, can contribute to disease problems. Be sure to look for seed varieties that have greater resistance to brown patch disease. Tall fescue can be a high water user in summer, especially in the transition zone, southern and western states. There are, however, a few secrets to proper watering to keep fescue green in summer. The most important thing about watering is to water deeply, preferably in the morning hours. The soil should be wet to a depth of three or four inches. After watering, wait several days until the grass appears to suffer from heat or drought stress. It will begin to change color to a bluish green. The color results from the grass blade folding to conserve water, thus showing the lighter underside of the grass. When you see this, it is time to water again. The purpose for watering like this is to force the roots to grow deeper. This will enable the grass to endure extended periods of heat without damage. Frequent, shallow watering encourages shallow rooting which is not good for the grass or your water bill. If shallow rooting occurs, any extended periods of heat could cook the roots and harm the grass. Another method is to allow the fescue to naturally go dormant as the drought sets in. You may be surprised at how well the grass will respond once the drought is over, even if the grass was completely tan colored. If you are entering drought conditions, don't water heavily and then halfway into it, stop watering. This may hurt the grass. If that is the case, you will do better to keep watering until the drought is over. Tall fescue should be mowed at heights no lower than 2 inches. Improved varieties can be mowed at heights of 1.5 in the cooler parts of the year. During the summer months, the grass should be mowed at 3 or 4 inches. It is the same for grass growing in heavy shade. Fescue can be purchased as sod. However, fescue cannot be made into sod without blending it with another grass type, such as bluegrass. Fescue is a bunch grass and doesn’t have the structure required to hold sod together. For sod to hold together, it needs a grass with rhizomes or stolons. Bluegrass produces rhizomes, which are stems that grow just below the soil surface. When sod is harvested, the root system is cut. It is the rhizomes from the bluegrass that hold the sod together and keep it from falling apart. Overseeding is important with tall fescue. A blade of grass only lives an average of 40 days before it dies. Grass must continue to produce new blades to replace the ones that are dying back. Grass is like all other living things and will slow down as it gets older. Eventually, its production of new grass blades will fall behind the rate of older ones dying back. To keep fescue young and healthy requires overseeding. Many professionals overseed every year or every other year. The photo shows Turf-Type Tall Fescue from BWI. It is a five variety blend. It is an excellent product and one I have used many times. This comes in 50# bags. The best method for planting grass seed is by using a rotary spreader. It will broadcast the seed instead of dropping it as when using a drop spreader. Great precision and extra work is required if you use a drop spreader. For cool season grasses, including tall fescue, the best time for planting grass seed is in the fall. If the fall is not possible for you, then the second best time for planting grass seed is in the spring. The biggest problem with spring is that the grass may not have time to develop sufficient rooting before the summer heat arrives. Many well started lawns have suffered or were lost due to a late start and hot summer weather. When overseeding established lawns, use approximately 4 lbs. of seed per 1000 sq. ft. If you are seeding bare soil, use a rate of approximates 6-8 lbs. per 1000 sq. ft. Lightly rake a thin layer of soil over the seed and keep the soil moist until germination. Germination can take from 14 to 21 days. In some areas of the country, wheat straw is lightly spread over the seeded areas to shade the grass. There will be some wheat that germinates, but wheat can’t take low mowing, and after a few cuttings, it will die back. Once the seed has germinated, cut back on the watering schedule. Note: If you are going to overseed with no additional irrigation except rain, be sure to plan it well. Try to overseed the day of or the day before a string of storms are due to come in. Have the lawn prepared in advance in preparation for overseeding. Spread the seed on dry grass for the best affect. Wet grass will cause the seed to stick to the grass blades instead of falling down to the soil. The amount of fertilizer to apply to a lawn is usually given in "pounds of nitrogen per 1000 sq. ft." Regardless of the percent of nitrogen listed on the bag, you can put the right amount down by following certain principles. See the “fertilization section” for how to develop a good fertilization progrom. Fescue should be fertilized at 3-5 lbs of nitrogen per year per 1000 sq. ft. Three quarter of the nitrogen is applied in the fall. During the hot summer months, high nitrogen fertilizers should not be applied, or if necessary, use only slow release. In fact, organic fertilizers can be used in the summer months. Organics are slow release using the soil micro-organism to break down the organic matter. I prefer to use a rotary spreader instead of a drop spreader. Rotary spreaders are more forgiving and easier to use. I have seen a number of streaked lawns after the homeowner fertilized using a drop spreader. Tall fescue is subject to damage from a number of insects including white grubs, army worms, cut worms and leafhoppers. Grub worms can be one of the more damaging insects. They feed at night, chewing through the grass at soil level. A number of controls are available, including some new selective controls that target only the insects that feed on the grass. See the section on Pesticides for more information. A good biological control for white grubs, sod webworms and cut worms is the microbial insecticide called “Baccilus Thuringensis”. Once consumed by the insects, it kills by producing toxins within their gut. Mach 2 is another biological control for insects that pupate. The active ingredient is "Halofenozide" and kills the target insects by interrupting the pupation stage of larvae without harming beneficial insects. This product needs to be applied well in advance of any damage. It will have no effect of applied at the time insects are damaging your lawn. Quick kill products include trichlorofon (dylox) and carbaryl (sevin). Be aware that thatch can hinder the movement of insecticides to the root zone where grubs live. Some pest controls, including some biological controls, are available only to certified pesticide applicators. Many commercial applicators will apply what you need without selling you a whole program. Check with companies in your area to see. Once a disease begins the disease progression will usually halt when the environmental conditions that promoted it changes. That is an important thing to know. Disease pathogens that are living in and around the soil cannot infect the grass unless the environmental conditions are right for it. To better understand grass diseases, see the section on Grass Diseases. One of the most damaging diseases is the disease called brown patch. Brown patch is generally a problem in hot, humid weather. It begins in the leaf blades and can progress to the grass crown. Once it affects the crown, the grass can be seriously injured or killed. If you suspect a problem with brown patch, avoid applications of nitrogen fertilizer, herbicides and night irrigation. It will only fuel the disease. There is an organic fungicide that is labeled for Brown Patch. It is called "Actinovate". Actinovate is natural bacteria that feeds on pathogenic bacteria and fungi. It can be used as a preventative and a curative and is safe for pets and children. It must be applied before the grass crown is affected. Once the crown is affected the plants will die. Actinovate is excellent on soil born pathogens, as well as other diseases. AgriGro biostimulants (on our products page) have been documented to suppress disease pathogens and lessen the effects of environmental stresses. Regular maintenance with biostimulants can greatly lower the occurrence of diseases. Other fungicides, such as Daconil, are available for homeowners to halt the disease, but timing is important. It must be applied before the disease effects the grass crown. Many improved varieties of tall fescue are available with greater brown patch resistance. Tall fescue can also be affected by leaf spot and fusarium blight. Leaf spot is generally a problem in cooler, damp spring weather, but is not usually too detrimental to the grass. Fusarium blight can infect young grass that was planted in the spring. Higher mowing heights (3 to 4 inches), proper irrigation and fertilization are things that can reduce stress and help grass to resist disease problems. Click on the link for specific information on different TurfGrass Diseases and Treatment Options. The use of organic fertilizers can also help. Organics feed the beneficial micro-organisms in the soil, which in turn, feed upon disease causing pathogens. Kentucky bluegrass is used more widely than any other cool season lawn grass in the U.S. 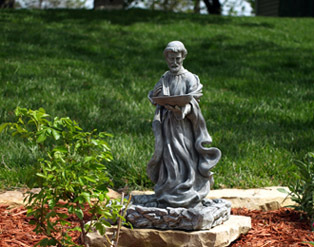 Learn why it is so popular and how to plant, grow and care for it. Ryegrass has come a long way the the introduction of new turf species. See the pros and cons of using the perennial or annual varieties. The fine fescue grasses are known for their exceptional shade and cold tolerance. They also have some of the narrowest blades of any grass type. Click here for detailed information about its climate range, uses and management. Watering a new lawn is very different from watering a mature lawn. When planting a new lawn, success will be greatly increased by learning proper watering techniques. Lawn overseeding is one of the most overlooked practices by homeowners. However, it is one of the most important steps you can take to maintain a consistently thick and beautiful lawn. Find complete information on why and how to overseed correctly. An unbiased look at organic fertilizers, how they work and how to best use them to your advantage. Includes detailed information on natural organic fertilizers and organic/synthetic fertilizer blends. Fertilizing a lawn can be tricky if you are not sure how to do it correctly. Find everything from understanding fertilizer ingredients to calculating fertilizer rates to planning your fertilizing schedule for the entire year and more. Fall winterization is the most important time for fertilizing cool season grasses. Warm season grasses do not receive the same treatment. Find everything you need to know to winterize both cool and warm season grasses. Lawn moss is a common problem in yards. However, its presence represents deeper soil problems that must be fixed or the moss will stick around. Find out what must be done to finally end your moss problems. We all love our pets, but dog urine can do a number on grass. There is hope. Find out what can be done to save your lawn and your pet too.